I would like to preface this blog post by saying that classes, professors, exams, and studying are wonderful tools. College teaches you the fundamentals while doing the best it can to prepare you for your chosen career. However, books and theory can only do so much. I’m here to share with you the unique lessons that internships teach college students. Make connections. Network. Form relationships. These are all phrases that are reiterated to young professionals. What they don’t tell you, is that it can sometimes be hard to go out and connect on your own. By interning for a company or firm, you make different connections weekly and sometimes even daily. The relationships you form can teach you countless skills, help you to collaborate, and increase your chances of finding a career after college. My personal experience at Rhudy & Co. has encouraged me to talk to anyone I meet, both in and out of the office. You never know where a short conversation can lead you. It isn’t uncommon for a project to be assigned and due the same day. Sometimes, you have to work as efficiently as possible to meet a client’s needs. By getting first-hand experience, you learn the importance of doing your best work at your best speed. This skill is beneficial to both schoolwork and a job post-graduation. It is almost impossible to figure out exactly what you want in a career until you experience, learn, and discover what you have a passion for and where you succeed. By interning, you can learn where in your field you fit in and what specific jobs are the best for you. 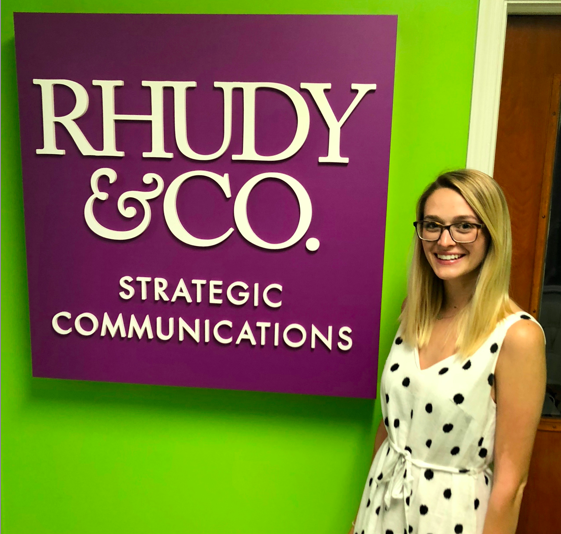 I quickly learned at Rhudy & Co. that the field of strategic communications is something that interests me. While just studying in school, I wasn’t always sure where I saw myself in the communications field. Now, I’ve learned what area I enjoy, which will give me a leg-up when I enter the real world. The people you work with make a difference. Working with good, honest, and kind-hearted individuals make it easier to connect and build relationships. If you trust and respect your colleagues, business will be better. By far, this is the biggest lesson I learned while interning with Rhudy & Co. My team members were just as eager to teach as I was to learn. Without these outstanding people, I would never know what to look for in a future career. It’s not always just about the job, but those surrounding you in that job. Kristen Livingston is a senior at James Madison University in Harrisonburg, Va., studying creative advertising. As a native Richmonder, she misses her daily walks to Stella’s for quinoa shakers in Rhudy & Co.’s work neighborhood of Scott’s Addition.